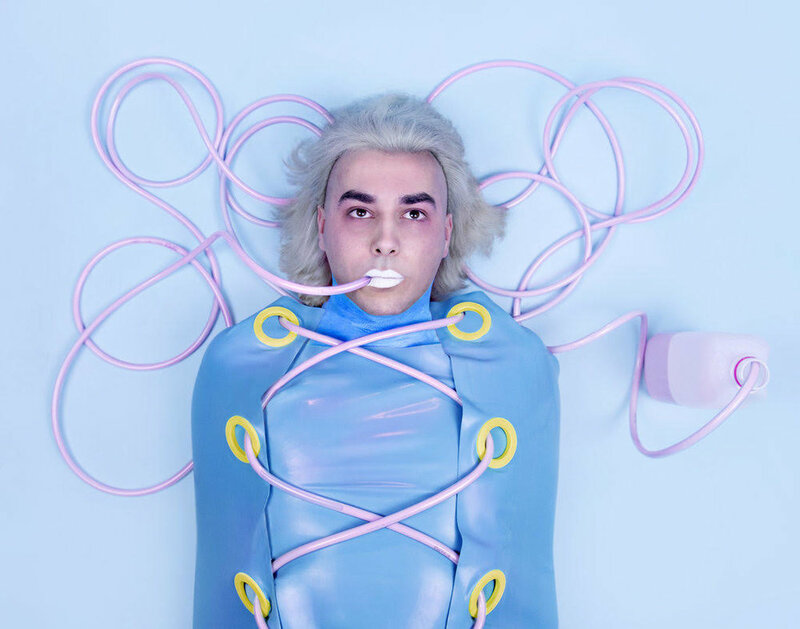 Meet Melbourne art pop producer and vocalist, Blyolk. The release of his new single ‘Dogspeed’ marked a new chapter for the pop powerhouse as he refined his lyrical and sonic messages. We caught up with Blyolk to delve deep into his new single, as well as have an exclusive behind the scenes look at the track’s composition. Futuremag Music: Hey Blyolk! How has everything been after the release of ‘Dogspeed’? Blyolk: Hey Sean, it’s really lovely to chat to you, I’ve been a fan of the Futuremag Music for a while. The reception to ‘Dogspeed’ has been fantastic! It’s been really accepted by the old fans and it’s also bringing new ones onboard. With each release I like to push myself out a little further and seems that Blyolk reaches newer and wider audiences too! triple j and the Unearthed team have been great, it was fab to hear the track on Home And Hosed last week and unearthed reviews from the triple J presenters I really enjoy listening to! I’ve been nice and busy, I’ve been prepping for my headline show next Friday 12th April. We’ve almost sold out and I’m really excited to show everyone new music. Just got this amazing guitar pedal (the line 6 hx effects) and I’ve been spending all day recreating wacky sounds off the record to play live. I’ve also been eating a large amount of dumplings which is a bonus. Futuremag Music: It’s been a while since we’ve heard new music from you, but it’s well worth the wait! What direction are you planning to take your debut EP? Blyolk: It’s my first EP and it’s something I’ve had as a goal for the last two years. It’s definitely poppier, crazier and bigger sounding than anything I’ve done before. Blyolk is me, I am Blyolk obviously, but it’s really taken the time for me to fully accept that. As a result I feel that the new songs are a lot less filtered and express a lot of feelings that I’d usually shy away from showing for fear of.. I don’t even know. I’ve been working with some amazing producers Sam Sproull and Toby Dundas who’ve really helped me realise this in the process. It’s the EP I’ve always wanted to make, even if I didn’t quite predict how it would’ve turned out. Futuremag Music: The single art from ‘Dogspeed’ is so fun! What was the process behind it? Blyolk: I couldn’t have predicted that I’d be spending 5 hours lying on the floor in a latex cocoon, but there you go. It’s the things you do for art! Giulia McGauran (the photographer) and I did a bunch of brainstorming to form a concept. We then worked with the amazing Thursday Hang to create the costume. Shoots are groossss btw, I nearly threw up on Giulia from drinking a litre of milk in 5 minutes and I got a HUGE blister on my back because it was skin tight. It’s really cool that all the colourful ideas to me still convey the idea of soul suckers from the ‘Dogspeed’ track. Futuremag Music: For those who haven’t had the chance to catch your live show, how do you incorporate your music on stage? Blyolk: I’m definitely not a fan of artists that stand still behind a laptop and call it a live show! I really like to think of it as a show in all senses of the word. I try to make something that I’d want to watch if I was an audience member. Electronic music is always really tricky to translate live, because there’s often so many parts going on. Mura Masa summed it up really well, it really helps to do something visual. Something I really like about modern music is that you make music that sounds great on headphones and a UEboom but then still do something even crazier and more energetic live. Setup wise I play guitar, trying to make it sound like normal electric as well as bass guitars, synths, 12 string guitars and acoustic guitars with a bunch of pedals and Ableton effects. We also have two backing vocalists, some percussion and a saxophone. I try to make it a party up on stage! Futuremag Music: How did you come up with the idea for that behind the scenes video? Blyolk: The idea behind the Dogspeed 101 clip was to give a little insight into the create process for Blyolk. I try to show off a few layers in the song and talk about the story behind the track. Really though it’s any excuse to drink strawberry milk. My favourite flavour until they make a caramel BIG M.
Futuremag Music: What else do you have planned for 2019? Blyolk: So keen to show the world what I’ve been working on for the last year on this EP! I’d really like to make it to some more places around Australia for shows, meet more people, eat more dumplings, collaborate with new people and continue to write and make the best music I can. Futuremag Music: Lastly, if the Blyolk project were a cocktail, what would be in it? ﻿Blyolk: The blyolconut - Malibu coconut liqueur, brown creamy soda, lime, pineapple, Vietnamese red and green jelly and a handful of sour gummy worms before you drink.